Sauerkraut is traditionally made in autumn, when cabbages grow big, white, and sweet in the chilly air. The cold weather helps them develop a high water and sugar content, which in turn helps the cabbages to ferment well. But you can make kraut from early cabbage—that is, cabbage you’ve harvested in mid-summer. I did so recently, when I found my refrigerator drawers overstuffed with the little red and green cabbages I’d brought in from the garden. This was the perfect opportunity, I figured, to try out the airlock mason-jar cap that Richard Washburn of New Eden Farm had kindly sent me. Devices like Richard’s have become popular among fermentation faddists, folks who will try fermenting just about anything, in small amounts. Many of these new breed of picklers are using little salt—so little that their pickles are prone to spoilage. Some people compensate for this by adding whey to boost the acidity of the brine or by using an airlock to keep out yeast and mold. Richard makes his device with a standard little plastic airlock, available from home winemaking suppliers for a dollar or two. 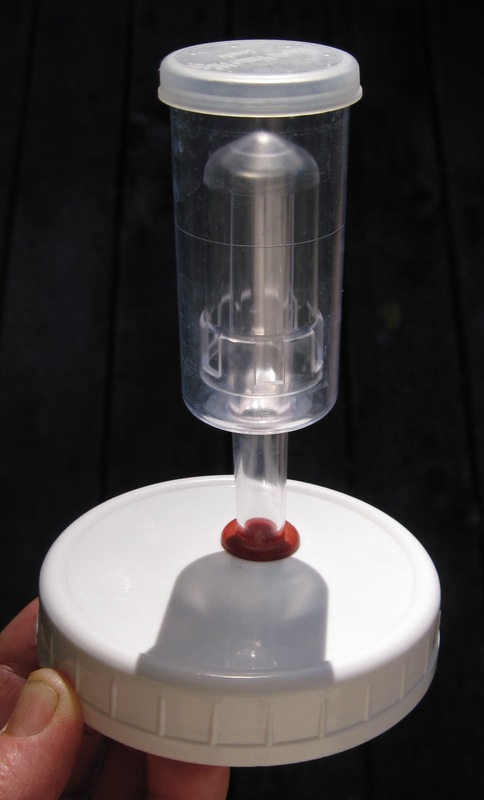 When the airlock is partially filled with water and inserted in an opening of a sealed container full of fermenting liquid or vegetables, the carbon dioxide produced by the fermentative microbes is released through the water, thus preventing the container from building up so much pressure that it explodes. By keeping air from entering the container, the airlock also serves as a barrier to airborne yeasts and molds that might otherwise contaminate the ferment. This is the same way that a crock with a water trough works. Richard attaches the airlock to a plastic wide-mouth Ball storage cap with a silicone grommet. The cap fits both a wide-mouth quart jar and a wide-mouth two-quart jar. One of my 1¼-pound cabbages, grated, would easily fit in a quart jar. I could even add some carrot or apple or both, as Russians often do to boost the sugar content of early cabbage. Since none of my apples were ripe yet, I chose carrots. I cut the cabbage quickly on my inexpensive little Kyocera mandoline, whose secret is its ever-sharp ceramic blade. I grated the carrots on an ordinary box grater. Mix the cabbage, salt, and caraway. Pack the mixture firmly into a quart jar, and weight the mixture. If it isn’t covered well by brine within a day, stir ½ teaspoon salt into ½ cup water, and add enough of this brine to cover the cabbage well. Let the cabbage ferment at room temperature for 3 to 5 days, and then serve it immediately or store it in the refrigerator. Using an airlock doesn’t erase the need to weight the vegetables; they must stay under the surface of their brine. So I added a glass candle holder, and then a second, and a third. The third ended up pressing against the airlock cap. A freezer-weight plastic bag filled with brine would have worked as well. By the third day the sauerkraut was bubbly, and after four days it was lightly sour. There was no sign of yeast or mold in the jar, so I can attest that Richard’s airlock cap did not fail me. I replaced it with an unaltered plastic cap and stored the jar in the refrigerator. Russians often serve pickled cabbage as a salad, dressed with a little sugar and unrefined sunflower oil. Adding sugar may sound strange, but the sweetness balances the sourness of the vegetables and the bitterness of the caraway (which you can of course leave out, if you prefer). Sunflower oil has a strong taste that takes getting used to, but it’s worth trying if you have a Russian market in your area. Otherwise, you can dress your salad with olive, walnut, or hazelnut oil. Or use your pickled cabbage in any way you might use long-fermented sauerkraut. Other airlock devices for small-batch pickling include the Fermenta Lock Airlock , the Pickl-It system, and the ReCAP Fermenting Set. Have you tried any of these? Do you know of others? I would be grateful if you’d share your experiences. This entry was posted in Fermented foods, Pickles, Preserving science, Vegetables and tagged airlock cap, cabbage, fermenting, Finest Ferment, pickling, recipe, Richard Washburn, sauerkraut, water lock. Bookmark the permalink. Hi Linda, I am currently faced with the same wonderful problem, too much cabbage, and would love to try this. If I have no special air-lock lid or crock, how do I do this? Can I simply use a quart Weck jar and not clamp the glass lid down, but weight the cabbage inside the jar with something? Marsha, you definitely want to weight the cabbage, or else it will float and spoil. The easiest thing to use is a freezer-weight plastic bag filled with brine. You could use plain water instead of brine, but if the bag leaked the water would dilute the brine in the jar. For such a small amount of cabbage, 1/2 teaspoon salt in a cup of water should do, but make sure you have enough brine to cause the bag to swell against the side of the jar. This will keep any yeast from growing on the surface of the kraut. Other kinds of weights are glass (like my candle holder, or a smaller glass jar filled with water) and clean, hard rocks. In a wide container, a plate is usually laid over the kraut before the weight is placed on top. Hi Linda, thank you for your reply. My question is really about the lid, must it be clamped shut, or can it just sit on top. This is a Weck jar with a glass lid that sits on top of a rubber seal. Should the jar be sealed or just covered? I’m looking forward to this, I can taste it already! Leave it unclamped, Marsha, so you don’t risk an explosion. Hi Linda , So sorry I am going to miss you in Lincoln City this year. Westin Price is in Pdx. I’ve been using the Perfect Pickler from the same name with a dot com. I’ve had good luck making kraut and pickles. It really work well with your recipe for Dutch Half Sours. Thanks for that report, Bob. I sent this to my daughter. She make kraut with me using my water trough crock and she found all the work a bit daunting. I think a mason jar’s worth would be good for her. I have to try this! We used to have the best Russian restaurant that served a pickled cabbage salad with olives…..I have looked for the recipe ever since they closed. Do you think the cabbage was pickled with the olives in the same jar? What kind of olives were they? I’ll bet you’re right in guessing that the olives were mixed in right before serving. Otherwise they would stain the cabbage, I think. My first attempt turned out rather well. Used Glass Nescafe Coffee containers and pressed the cabbage down with glasses – bottom first that snugly fitted inside the glass jars. To keep Air out I then just wrapped them well with cling wrap and voila !